Steve Lulek says the story of his guide business Vermont Adventure Tours is a classic one – but with a few twists and turns that make it uniquely his. Lulek’s parents left when he was a young boy, and as he was shuffled from home to home, he was put in the category of ‘youth at risk.’ That is, until he joined a boy’s club at the local church. That club, and the outdoor activities that went along with it, stayed with him long after he left the program and joined the military at age 18. Days before boot camp, Lulek met the love of his life. He was so sure of that fact that he asked her to marry him six weeks into training – having only known her 10 days. Yet, even as he began the adventures of marriage and military duty, the outdoor adventures of his youth were always on his mind. He climbed swiftly through the ranks, ‘dabbling in adventure,’ as he tells us, and when it came time to move on or move up, Lulek was selected for mountaineering school through the Army National Guard. It was here that he mastered climbing, survival, navigation and wilderness medicine. To instruct, as he puts it, you had to go do it. Over 10 years and through a “series of miracles,” Lulek and his wife purchased a climbing gym, where their guide service could finally take shape. Steve takes care of the adventures, while Sherry keeps things running behind the scenes. They developed adventure recreation and therapy programs. Qualified to teach the world’s finest soldiers, Lulek really wanted to work with Central Vermont kids who needed him. 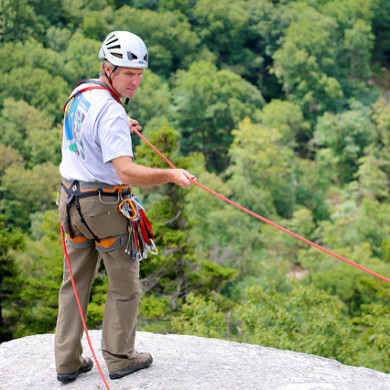 Today, the custom guide service offers packages including paddling, cross-country biking and rappelling. Vermont Adventure Tours has recently partnered with the newly rebranded and renovated Killington Mountain Lodge to offer special adventures from mountain traveling to wilderness survival. For more information, check out our hotel packages or visit the Vermont Adventure Tours website.